Thank you for visiting my portfolio. 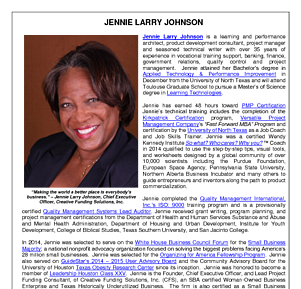 I am Jennie Larry Johnson, Chief Executive Officer, Creative Funding Solutions, Inc. I am also a Human Performance Improvement and Training Evaluation Specialist. I design, develop, implement and evaluate instructional designs for face-to-face, synchronous and asynchronous training programs based on Vygotsky's "Zone of Proximity" pedagogical constructivist learning philosophies and Habermas' pragmatic theories of communicative action. I employ Thiagarajan's process of Rapid Instruction Design processes to design instructional design systems to improve human performance along the affective, cognitive, and psychomotor domains as advocated by Bloom's Taxonomy. Because I am a Kirkpatrick Partner's Bronze Certified training evaluation specialist, I use the Four Levels of Training Evaluation methodology while evaluating the effectiveness of training programs. Put simply: I design job training programs that put people to work! This online portfolio was designed to provide you with additional information concerning me and the learning projects I completed while pursuing my Master's - Learning Technologies degree from the University of North Texas' College of information and am currently pursuing a doctoral degree in Workforce Leadership and Development at this university. This website will provide you with additional information regarding several of projects I completed as Chief Executive Officer, Creative Funding Solutions, Inc., a consulting firm I started in October 2001, as well as scholarly works I prepared while pursuing my degrees. I hope this portfolio will provide you with all the information you will need to determine how I may be of assistance to you or your employees in the areas of applied technology and performance improvement. 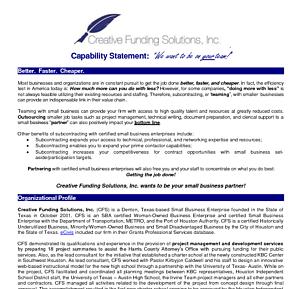 But, after reviewing my portfolio, if you have questions or need additional information about me, Creative Funding Solutions, Inc., my educational background, or past accomplishments, please contact me at 832-524-7667. Thanks again for visiting my portfolio. Please also visit my LinkedIn Profile for a more in-dept look at my training and education. I look forward to hearing from you soon.